This pickled dish can be served as a salad or an appetizer. But since I am so Chinese, I eat it with rice like a side dish. The glass jar was bought from IKEA years ago, and cost me $1.99 at the time, I believe. 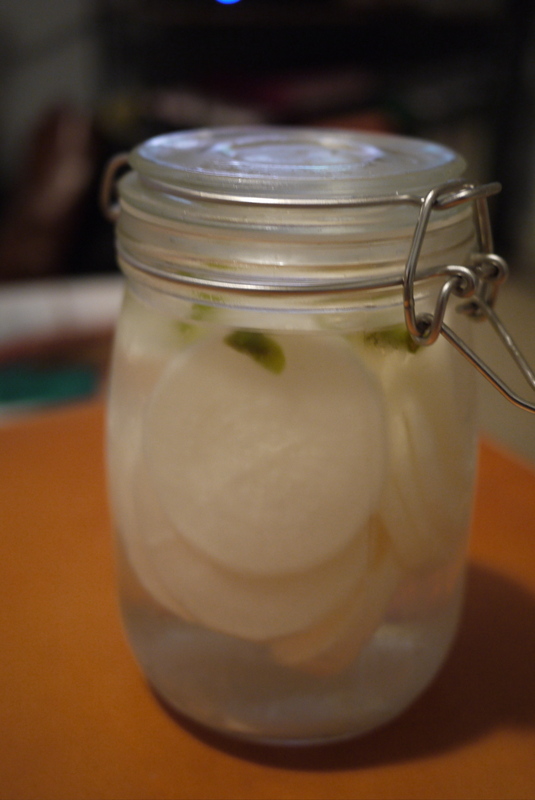 What goes into the jar: One medium daikon peeled and sliced; 3 parts rice vinegar (filled up to 3/4 of the jar); 1 part water; 1 cup of sugar; 1/2 cup of kosher salt (according to Alton Brown that is the better salt to use when pickling); 3 gloves of garlic, smashed; and 2 thai chillies, roughly chopped. Leave it in the fridge to soak for at least 3 days. One week is even better. For the 1% of you who are not familiar with this root vegetable, Daikon is related to radish and turnip but has a milder, sweeter taste. Although it is now commonly known for its Japanese name (daikon— meaning large root), the vegetable itself is near and dear to many Asian cultures.